Recently the Economist had excellent coverage on the huge growth in data on the internet in quite some detail. The amount of digital information increases tenfold every five years! 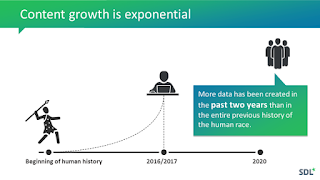 They actually suggest that this data deluge is equivalent to the industrial revolution in overall impact, and that we are moving to what Craig Mundie, head of research and strategy at Microsoft calls a “data-centered economy”. He suggests we are at the nascent stage and that the infrastructural and business models for this new world are not well understood and are just being formed. He also says that big societal and macroeconomic changes are coming with the data economy. Data are becoming the new raw material of business: an economic input almost on a par with capital and labor. If you are skeptical, look at at Wal-Mart, Amazon, Google, Netflix, EBay, Farecast and see how data collection, organization, leverage and analysis underlies their core business mission and value. -- The changing nature of the information required to build loyalty in the global customer base. The continuing evolution from static documentation to dynamic user and community created content that is considered the most valuable content in customer support is one example of how dramatic this shift is. The word of mouth impact on products and companies in social networks is already powerful and will become even more so in future. -- There is also now evidence that crowdsourcing is and will continue to be a force in getting things done in the translation world, not so much because it is cheaper, but more often because it increases customer engagement and allows global companies to address long tail issues in a cost effective way. It does not work everywhere, but it is a model worth understanding and using. Also, we are likely to see more groups of highly motivated amateurs focus on large translation projects like the Yeeyan, Global Voices, Meedan initiatives already show. However, in 2010 in the professional translation world (and elsewhere), people have gotten used to the tools and processes that got us here. If you look back ten years, I would say we’re not doing things too differently from the way we did in 2000. We use essentially the same software and processes we did back then, though things have sped up a bit and maybe TMS systems are taken more seriously of late. It is very much a TEP world that is optimized for the global business and localization reality of 2000. Professional translation services firms try and build value around project management capabilities and un-definable notions of “quality”. It is ironic that an industry “leader” is named SDL, which originally stood for Software and Documentation Localization. Do they really do any more than that today? Part of the website? Google applies this principle of recursively learning from the data to many of its services, including the humble spell-check, for which it used a pioneering method that produced perhaps the world’s best spell-checker in almost every language. Microsoft says it spent several million dollars over 20 years to develop a robust spell-checker for its word-processing program. But Google got its raw material free: its program is based on all the misspellings that users type into a search window and then “correct” by clicking on the right result. With almost 3 billion queries a day, those results soon mount up. So as we head into this data economy what will professional translation companies need to do to thrive? It is clear that this is a time for innovation and real fundamental change, in both process and focus. A recent LISA report on Crowdsourcing has this statement from a senior Dell executive in the executive summary that summarizes what global enterprise buyers are looking for. This little promotional video for the book Different by Youngme Moon of the Harvard Business School, I thought had a very compelling message that is especially pertinent to the professional translation industry today. Innovation is something we should all be thinking about and I would bet that collaboration is something that will help and further this exploration. I look forward to sharing this journey with you.